Bombardier Inc. (BBDb.TO), which has lost half its market value in the last six months, is about to get its chance to soothe Wall Street. Shareholders are still reeling from Bombardier’s cut last month to its cash-flow forecast, which the company blamed on its train business after years in which aircraft investments devoured resources. Chief Executive Officer Alain Bellemare’s mission at an analyst meeting in New York on Thursday is to explain why the struggles will be short-lived. Bellemare is trying to restore investors’ faith in the second half of his five-year turnaround plan after already mapping out 20,000 job cuts, raising more than US$7 billion and pivoting away from commercial aircraft manufacturing. The disappointment at Bombardier’s rail business, a division trying to overcome high-profile stumbles in Toronto and New York, is fueling doubts about the CEO’s ability to attain his long-term goals. The rail business, which already accounts for more than half of total sales, is increasingly important to Bombardier’s future as the company moves pivots away from passenger planes. In an effort to eliminate a cash drain, Bellemare this year ceded control of the fledgling CSeries aircraft to Airbus SE, which renamed it the A220. He’s also selling Bombardier’s turboprop program and considering options for its regional jets. Bombardier pinned the weak cash-flow outlook for 2018 and 2019 on increased working-capital needs at its train division, which is increasing output. The forecast spurred questions about the company’s ability to boost earnings and cash flow while reaching US$20 billion of sales in 2020. 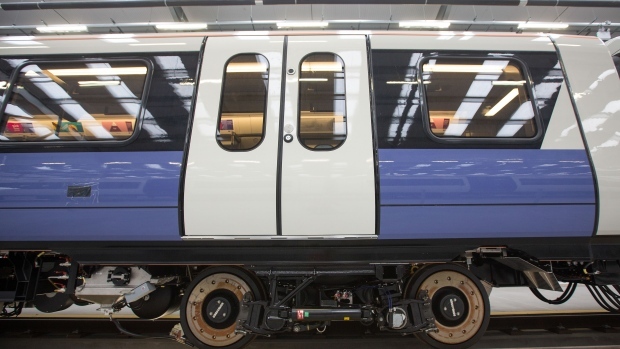 Bombardier’s recent stumbles in rail equipment are stoking misgivings. The company has missed a string of deadlines to supply light-rail vehicles and streetcars to Toronto. Last year, Bombardier was excluded from bidding for a US$3.2 billion New York subway-car contract because of past delays. And the Canadian government recently signaled it wouldn’t force state-owned Via Rail to pick Montreal-based Bombardier over Germany’s Siemens AG for a new rolling-stock order. Bombardier’s widely traded B shares rose 2.8 per cent to $2.17 at 10:58 a.m. Wednesday in Toronto. As of Tuesday’s close, shares had tumbled 33 per cent after the company chopped its cash-flow forecast Nov. 8, the biggest drop on a Standard & Poor’s index of Canadian industrials. The CEO and his team will certainly have some upbeat messages for investors. Bombardier’s Global 7500 private jet, poised to debut this month, has “blockbuster” potential, said Morningstar’s Higgins. Having completed multibillion-dollar development programs on that plane and the CSeries, Bombardier “can become a cash-generating machine for many, many years to come,” Chief Financial Officer John Di Bert said in a presentation last week. The rail unit has racked up a US$33.9 billion backlog of orders. It won recent praise from a key investor, the Caisse de Depot et Placement du Quebec, Canada’s No. 2 public pension-fund manager. The Caisse owns 27.5 per cent of Bombardier’s rail unit, as well as a smaller stake in the parent company. Bombardier’s bonds have recouped some losses since the cash-flow forecast cut. The 7.5 per cent notes due in 2025 jumped to 95.625 cents on the dollar Tuesday, from a low of 90 cents on Nov. 16. The bonds traded as high as 105.9 cents in July. Bombardier is rated B- at Standard & Poor’s, six notches below investment grade. The company’s credit-default swaps are the worst performers among Canadian issuers since the start of the year, according to data compiled by Bloomberg. The cost to insure Bombardier debt against default for five years has widened by about 230 basis points this year to about 613 as of late Tuesday, the data show. Bombardier had about US$9.5 billion of adjusted debt as of Sept. 30, with the next major maturity -- of US$850 million -- in March 2020. Di Bert said Bombardier would like to refinance its 2020 maturities next year. While the company has explored a repurchase of the Caisse’s rail stake, the priority is to maintain strong liquidity and protect its credit rating, he said. In the shorter term, Bombardier must persuade shareholders that it has a handle on cash flow. Fitch Ratings last week downgraded Bombardier’s credit ranking to B- from B, citing the expectation that indebtedness will decline more slowly than planned because of the cash-flow deterioration.